Miss Lady Lace is involved with a vast number of exciting events, classes and workshop within Perth. 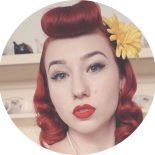 This page will be kept up to date with all her vintage endeavours to make it easier for you to be involved in the thriving pinup scene and to find out what Miss Lady Lace is up to. Miss Lady Lace’s Pinup Academy is a glamorous pinup, and burlesque school specialising in the art of vintage glamour. Gain confidence, fitness and have fabulous fun, join Miss Lady Lace for her FREE 2019 launch event with a fabulous class. For event enquiries, bookings or to have Miss Lady Lace at your next event email contact@ladylace.com.au or fill out the contact form below.